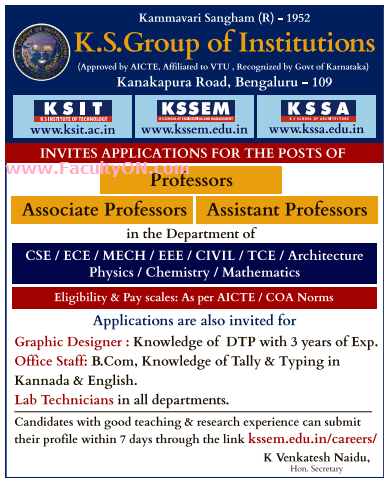 K.S.Group of Institutions, Bangalore has advertised in the DECCAN HERALD newspaper for the recruitment of Professor / Associate Professor / Assistant Professor Plus Non-Faculty jobs vacancies. Interested and eligible job aspirants are requested to apply within 07 days from 04th July 2018. Check out further more details below. College Profile: With a firm belief that quality and meaningful education only can lay the strong foundation for bringing about economic and social changes to the lives of thousand, the Sangham went about establishing educational institutions, starting with K.S. Polytechnic in 1992. Enthused with this success of its foray into technical education, the Sangham moved forward by starting the K.S Institute of Technology (KSIT). Its Engineering College in the year 1999. How to Apply: Interested and eligible candidates are requested to apply online through the link provided below.